Need an Article is a content mill where writers who are hired can select articles from a job board and get paid upon completion. In this way it is similar to several other content mills out there such as Textbroker, Interact Media, Media Piston, and Writer’s Domain, among others. However, no two content mills are the same, and the case is no different with Need An Article. The research for this review was a little different, and I had trouble finding current information from the chatter around the net. However, I was able to find an email address for some of the” powers that be” at Need An Article, and they were very open and gracious with the information they offered, a much of it is not readily available on their website currently. This is due to the fact that they are not currently hiring. Even though they are not hiring, they do have a form to put your name on the waiting list, so if you are interested after reading the review, head on over. How Do I Apply to Need an Article? When hiring is open, you can ask for the opportunity to apply. To be selected for the second step, potential writers must take and pass a basic grammar exam. Those who do well are allowed to move on to the second phase, which involves testing for specific categories. For each category tested in, writers are presented with a question related to that specific category and asked to create a piece that contains the specific elements asked for. Writers are allowed to choose articles in categories that they have tested for and passed. 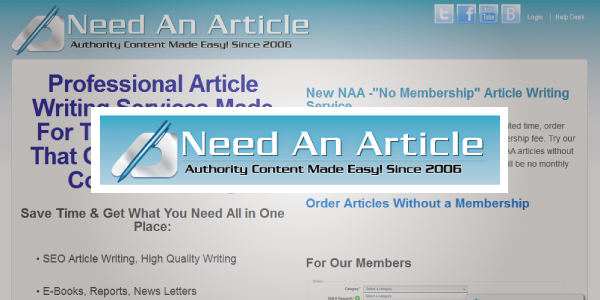 How Much Does Need an Article Pay? I am going to insert a personal opinion here, and it is just that. I believe the pay scale here offers amazing income potential depending on the amount of work available. Compared to similar sites, it really is outstanding. Writers are assigned levels based on their performance of the tests. A writer may be assigned different levels in different categories based on their performances in each. For example, a writer may do exceptionally well in Medical Writing, but not as well in gardening. They would therefore be assigned a different pay level for each one. Now, if you are familiar with content mills, you are likely having a heart attack right now as this is fairly high pay, but as always, there is a catch. The site does take a 7% commission. Despite this, after some slick math skills, I still believe the pay is exceptional for the industry for the simple fact that if you consider a 500 word article (which seems to be the standard based on what others are saying around the forums) then even at the lowest rate you are still making slightly over $.01 per word. This is slightly higher than several other sites pay even their mid-level writers, and it only gets better. Another important thing to note about the pay scale is that writers can retest at any time to try to move to a higher level. Customers also have the ability to pay more if more research is required than the standard pay scale would reasonably cover. They pay by PayPal weekly on Fridays, and according to those who work for them, you are paid immediately, before the article is accepted, and pay is always on time. This weekly pay system went into effect in 2006, and I could not find any complaints about it. I always try to see what others are saying, and while a lot of the information was older, there was nothing bad out there about Need an Article. Some said you have to be fast to get the work, and others noted that many of the jobs were posts for specific writers. One lady mentioned that had she not gotten sick and missed her quota, she would probably still be there. I asked Need an Article about the quota, and they said that during times of heavy work load that writers are asked to write a minimum number of articles each week to keep articles from sitting in the system for an undue amount of time. The minimum for part-time writers is 4 articles per week, and for full-time writers it is 6. Another writer posted that it was a nice, relaxing place to write, and still another stated how much she enjoyed being able to virtually interact with other writers and admin personnel. Are you as sad as I am that Need an Article is currently not hiring (as of August 2012)? If you want to be on the waiting list, you can go to needandarticle.com and find the link at the bottom to become a writer. It will take you to a form that will allow you to put your name on the waiting list to be contacted when they do begin hiring. One message I came across while researching said they would be hiring soon, but I am not sure how long it has been there. Of course, while the pay is great, the availability of work is not guaranteed. I did not see a huge number of complaints about lack of work, but you never know. While no content mill should ever be considered a sole source of consistent income, Need An Article appears to be a legitimate work-at-home opportunity that would be a great egg to add to a work-at-home basket. Nice… How long have you been writing for Yahoo contributor Network?